Ferrets are exceptionally playful, so expect your ferret to tip over his food and water bowls. Check on them often, tape them down, or use an unspillable bowl. Rodent water bottles are not recommended as a ferret may damage his teeth on the spout. Because ferrets have such rapid metabolism, they awaken to eat about every four hours. Fresh water and food should always be available to them. Ferrets eat only what they need and leave excess food for later, so one need not worry about over-feeding. Ferrets must be fed a high quality dry ferret or kitten food. Hard food keeps the ferrets teeth clean and makes their feces less smelly. The food should contain at least 32% protein, primarily meat, and 18% fat. Older ferrets can be fed dry cat food as they become less active due to age. Be aware that some ferret foods contain high quantities of fish oil and by-products. These types of food are soft, causing plaque and tartar build-up on the teeth, and also give the animal an unpleasant smell. Avoid dairy products (most ferrets are lactose intolerant) and nuts or similar items which the animals would swallow whole as ferrets do not have grinding molars like us. 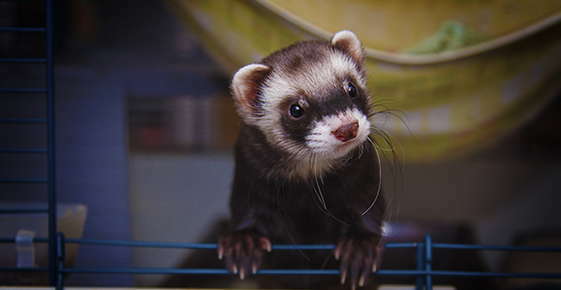 Ferrets are active, curious animals that should be allowed to run free when awake and be caged only when required. Should you not be able to allow the animals a large area with toys to roam about freely and explore, then ferrets are not the pet for you. If it is necessary to confine your pets periodically, they should always be kept in a cage large enough to allow separate sleeping, eating, litter and play areas. Generally, a cage of 30 inches by 18 inches can house one to three ferrets comfortably for a few days or for travel. If confined for too long, clawing and gnawing at the cage occurs and dental damage often results. When it is necessary to keep the animals in a cage, exercise in a large area conducive to exploration for periods of two to three hours twice a day is advised. Ferrets love to tunnel, so their favorite beddings are sheets, towels, blankets, sweaters and such. These items are ideal for ferrets to snuggle into (ensure that sweaters and blankets do not have decorations on them that the ferret can pull off and swallow). Small cardboard boxes, bags of plastic and paper, throw rugs and towels, white socks and clean linen: These are a few of a ferret's favorite things. Fancy toys are nice for humans, but the child in the ferret enjoys the things he can crawl into, under, and through, like drainage pipe and box lids. The leavings of the latest shopping expedition are the greatest gift mankind can bestow upon a ferret.